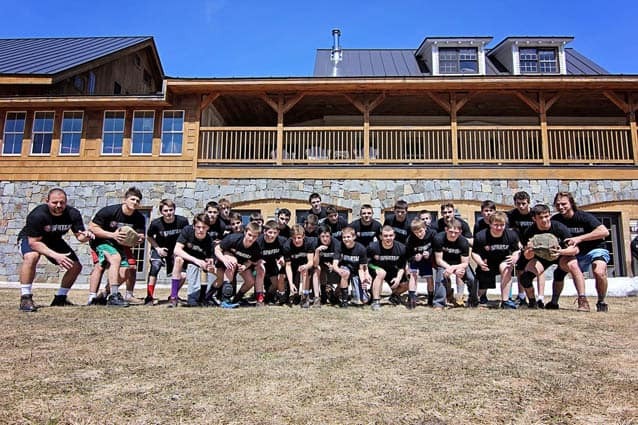 PITTSFIELD — June 17-19, dozens of youth wrestlers (ages 14-19) attended a two-day intensive high school Spartan Wrestling Camp at Amee Farm Lodge in Pittsfield, Vt. Most came to improve their wrestling techniques, but they achieved far more physically, mentally, and spiritually, stated Kim Peters, recreation director Killington Parks & Recreation and mother of a SWC attendee. In addition to the technical and physical aspects of wrestling. Campers learned how to mentally prepare themselves for challenges, whether on the mat or in life. Throughout camp, wrestlers were taken through a variety of fun Spartan obstacle course challenges that were instilled with the disciplines of wrestling. “The camp is different than others in that it stresses the mental edge that wrestlers need to succeed. It is very focused on a correct attitude to approaching wrestling and other challenges an athlete may encounter in their life,” said Spartan Wrestling Coach Jay Jackson. Sophomore Dakota Peters from Rutland High School, who competes on the Rutland High School wrestling team, attended the camp this year. He is one of only four athletes on the High School team, but brings with him years of training from his previous hometown in Ohio; he was encouraged to attend this camp by his high school coach Matt Tuscano.